The Victoria's Secret fashion show was taped in Miami last night with seven Brazilians girls on the cast: Alessandra Ambrósio, Adriana Lima, Ana Beatriz Barros, Izabel Goulart, Emanuela de Paula, Isabeli Fontana, and Flavia de Oliveira. Apparently the rumors were true, and Izabel is no longer a full-time angel. If she gets replaced by another girl, I do hope that girl is Emanuela de Paula. And how amazing does Alessandra look? I cannot believe she just had a baby three months ago. The show will air on CBS on December 3rd. All pictures via The Fashion Spot. Flavia de Oliveira sizzles in a selection of one-shoulder swimsuits and dresses in the latest issue of Vogue Brazil, photographed by Henrique Gendre. This is the second time Flavia de Oliveira graces the cover of Vogue Brazil this year, but I am not going to complain because she looks amazing in it. Flavia will not be in Rio later this week, but I heard that she is already confirmed for the Victoria's Secret show. Click here for Flavia's April Vogue Brazil cover. Scan via House Of Models. Because I missed seeing Flavia de Oliveira at the Paris shows last week, here are some pictures of her in the ad campaign for Brazilian designer Priscila Darolt. That is actually one of my favorite campaigns in Brazil this season. Will Ana Claudia Reconquer New York? Model Ana Claudia Michels was undoubtedly the biggest comeback this season on the runways in Brazil. This week Ford unveiled its new spring package, and she is on it. I hope bookers are paying attention. Her body looks amazing. 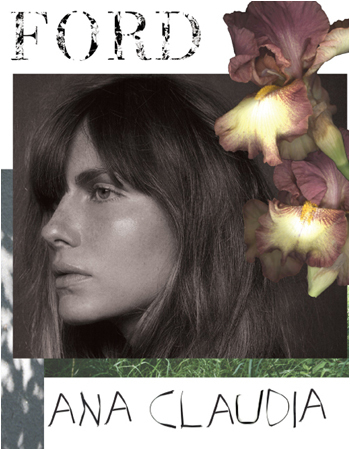 Check out Flavia de Oliveira's card from the Ford spring package after the jump. First of all, just let me say it is nice to be back in New York for a couple of weeks. It is humid as expected, and I love it like that. Now let's get down to business. I am completely obsessed with Brazilian newcomer Marlon Teixeira. He is featured in the new Armani Jeans ads with Jamie Dornan. Girlicious is not the new fierce. Isabeli Fontana joins Ashton Kutcher in the new ads for Pepe Jeans shot by David Sims. Ana Claudia Michels and Viviane Orth posed for the spring Iódice campaign photographed by Jacques Dequeker. According to Glamurama, Marc Jacobs and his Brazilian beau Lorenzo Martone are tying the knot this Sunday in Paris. Jonathan Adler and Simon Doonan are getting married in September. Catch up with Flavia de Oliveira at the beach during a shoot for Stiletto magazine. Male models come clean for Joe Lally. Speedo break: Mr. Giorgio Armani hits Sardinia in a tiny tanga. Britney is set to release a new album by mid-December. Producers and writers are the same ones which worked with her on Blackout, definitely my favorite Britney album to date. José Padilha has been tapped to direct Marching Powder, produced by Brad Pitt and Don Cheadle. Padilha is the director of Tropa de Elite, which hits American theaters in September. As if Frei Caneca in São Paulo was not gay enough, there is a new project in the works to turn it into the first officially gay street in the city.